St. Francis of Assisi Council and Court #155 are domiciled at St. Francis of Assisi Catholic Parish located in East Palo Alto, CA. They also have an established Junior Knight Branch and Junior Daughter Court #155. Asst. Jr. Knight Commander Darrell Dickerson. Court #155 meets the 3rd Sunday, monthly, after the 11:30 am mass at St. Francis of Assisi Catholic Church located at 1425 Bay Road, East Palo, Alto, CA. Click on the link above to view a year-end presentation on the history and accomplishments of St. Francis of Assisi Knights, Ladies, and Juniors of Family Unit #155. Check out the snapshots below of the Knights, Ladies, and Juniors of Unit #155 hosting a FREE B-B-Q at St. Francis of Assisi Church in East Palo Alto, CA for the entire community. 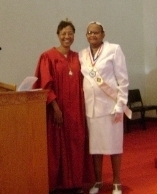 Lady Mildred Simon of St. Francis of Assisi Court #155 located in east Palo Alto, CA��awarded the 2009 Knights of Peter Claver Ladies Auxiliary Western States District Conference (WSDC)�Lady of the Year Award. Photo to the right:� Grand Lady Nell Bradley of Court #155 presents Lady Mildred Simon her Lady of the Year Medal during Mass at St. Francis of Assisi�on May 17, 2009. 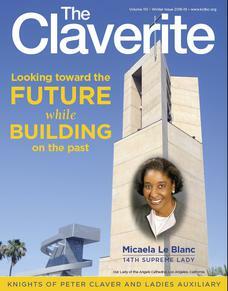 A Founding and Charter member of KPCLA Senior Court #155;� Helped establish Jr. Court #155; Active with Archdiocesan Council of Catholic Women (ACCW); Active with African American Council of Catholic Women; Active with St. Vincent De Paul Society; Member St. Francis of Assisi Parish Council; Eucharistic Minister-20 years; Every Saturday (and I do mean EVERY Saturday) providing clothing to the homeless and poor; Volunteer with East Palo Alto Senior Citizens Center; Provides personal services to disabled shut-in Senior Citizens; etc. Truly,� a woman who embodies the principles of Friendship, Unity, and Christian Charity. CONGRATULATIONS, Lady Mildred Simon, 2009 WSDC Lady of the Year.